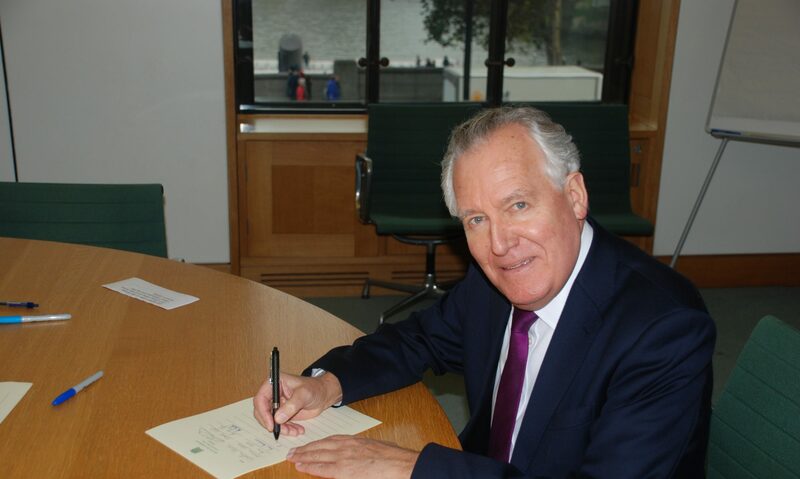 Mr Peter Hain (Neath) (Lab): The hon. Member for Basildon and Billericay (Mr Baron) spoke eloquently for the majority view in the House, as does the motion. May I apologise in advance for having to leave the Chamber if the debate runs past 3.15, as I have a long-standing speaking commitment? I am not a pacifist. I was a Cabinet Minister when the decision was taken to invade Iraq. I was Africa Minister when we sent troops to save Sierra Leone from savagery. But as a former Foreign Office Minister responsible for middle east policy, including Syria, I vehemently oppose British military intervention of any kind in Syria. We all share the Prime Minister’s genuine anger at the humanitarian disaster. We all agree that Bashar al-Assad has become a callous butcher who, instead of responding positively to non-violent protests when the Arab spring reached Syria in March 2011, drove his people into carnage and chaos. Russia and Iran have been culpable in the unfolding horror, and so have the Saudis and Qataris. But Britain, too, is culpable. We should have promoted a negotiated solution from the very beginning. Instead we began by demanding Assad’s unconditional surrender and departure. However, calling for regime change meant chasing an unattainable goal at the cost of yet more bloodshed and destruction, and so did supporting a rebel military victory. That was fatal. Britain should have offered a practical strategy to end a deepening civil war, because this was never simply a conflict between a brutal regime and the Syrian people. Assad and the ruling Shi’a-aligned Alawite minority form a 10th of the population and were never going to give up power if it meant, as they fear, being oppressed by the Sunni majority. Christians and other minorities are similarly nervous about change. Together those behind Assad amount to nearly a third of the Syrian people; add the Kurds and the total reaches about 40 per cent. Few of them like Assad or his Ba’athist rule, but they fear even more the alternative—becoming victims of genocide, jihadism or sharia extremism. This is not some simplistic battle between evil and good. Nor is it simply a battle between a barbaric dictator and a repressed people. It is a civil war, and a highly complex one into which Britain treads at its peril. It involves Sunni versus Shi’a, Saudi Arabia versus Iran and, a cold war hangover, the US versus Russia. Mr Jenkin (Harwich and North Essex) (Con): I do not necessarily demur from a single word of the right hon. Gentleman’s analysis of the complexity of the conflict, but what effect does it have on the efforts to bring those parties to the negotiating table when the International Criminal Court makes it virtually impossible to manage any kind of orderly transition, let alone continuity in the existing regime? He seems to be suggesting that that might be one of the options. Mr Hain: I will address that point in a minute. Regime change in Damascus could be the outcome of a negotiated solution, but if, as the UK and the US are effectively doing, getting rid of Assad is set as the precondition for talks, the carnage will continue. Surely we should by now have understood from Britain’s long and bitter experience in Northern Ireland that setting preconditions will prevent attempts at negotiation from even getting off the ground. The Prime Minister’s “good guys versus bad guys” prism is hardly made credible by the presence of al-Qaeda fighters among the west’s favoured rebels, nor by the barbarous murders of innocent Syrian citizens by some rebels. Other parties have started to intervene, such as Hezbollah, in turn dragging in Israel, another lethal development. The collateral impact of 1 million Syrian refugees in Jordan is especially dangerous. Iran will not back off because of its key interests. If the regime were somehow toppled without a settlement in place, the country could descend into even greater chaos. Russia fears that anarchy because, like the US and the UK, it has key strategic military, economic and intelligence interests in the area; for example, Syria provides Russia’s only Mediterranean port in a region where the US is well placed militarily. The only way forward is to broker a settlement, with Russia using its leverage to ensure Assad negotiates seriously. Like it or not, Russia is critical, as is engagement with Iran: otherwise, a Syrian settlement will not happen. The guidelines for a political transition approved by the five permanent members of the UN Security Council at the Geneva conference a year ago on 30 June 2012 still provide the best road map for a Geneva II, but the US, the UK, Saudi Arabia and their allies must drop their present stance and help to implement that. Preventing Iran and also Assad from attending a peace conference means that it will not even get off the ground. Transitional arrangements that reach the end point of democratisation are crucial, but their pace must be negotiated, not imposed. However unpalatable, Assad and his henchmen may have to be granted immunity to get them to sign up: hardly worse than the continuing barbarity and devastation of ancient heritage. All state employees, including the ranks of the armed forces, must be allowed to keep their posts, to avoid a repeat of the chaos caused by America’s de-Ba’athification in Iraq. The UN Secretary-General Ban Ki-moon’s call on 9 October 2012 for both a ceasefire and an embargo on more arms going to the opposition as well as Government forces, should now be heeded. A Yemen-type process may even figure. There a hated president did not actually resign but equally did not stand for re-election. This will all be incredibly, tortuously difficult, and I understand that Foreign Office Ministers are seeking to grapple with this on our behalf, but what is certain is that UK policy was always going to fail. The Prime Minister began with a demand for regime change, which did not work. Then he supplied “communications equipment” and other resources, which failed too. Then he tried to supply British arms and got the EU arms embargo lifted, until cross-party opposition in Parliament made that very difficult, if not impossible, to achieve. Unless there is a radical change, all the hand wringing and condemnation as atrocity follows atrocity is empty. Two years after the Syrian uprising, it is high time for Britain, France and the United States to change course. They, as well as their allies, including Turkey, Qatar and Saudi Arabia, need to recognise that neither side is going to win the civil war now destroying Syria. Instead a political solution has to be the top priority. Britain needs to work with its friends in the Syrian opposition and persuade them to go to Geneva with a credible plan for a compromise: local ceasefires, access to humanitarian relief, and the names of prospective members of a new Government of national unity, which will include Ministers from the current Syrian Government. Together they can initiate a process of constitutional reform for new parliamentary and presidential elections with UN observers. Only through mutual concessions by both the regime and the opposition can the people of Syria be saved from the current nightmare. All this is going to be incredibly difficult, as I said, but it is the only way forward, I strongly submit. The present policy and past policies have got us into this awful mess. Mr Peter Hain (Neath) (Lab): Is the Secretary of State aware that the Severn barrage will contribute 5% of Britain’s electricity needs? In deciding on the Government’s response to the Energy and Climate Change Committee’s report, will he support the project in principle and treat it exactly the same as other major power station projects, such as Hinkley, round 3 offshore wind and so on, allowing Hafren Power to raise the risk finance for the necessary work on habitats, environmental impact assessment planning, the strike price and other issues? Otherwise, he might as well kill off the project now. Mr Davey: Obviously, I shall not prejudge our response to the Select Committee, which, as the right hon. Gentleman will know, was not very positive about the Severn barrage scheme, not least because of the costs involved, but if he studies our announcements on draft strike prices for contracts for difference for renewables, he will see in there strike prices for tidal projects as well. It is absolutely clear that we will proceed only if we get value for money for the economy, the consumer and business. Mr Hague: That is clearly the intention of what I said, although I do not think it right to compare this situation with Libya or ever to give a 100% guarantee. After all, in Libya we acted very urgently to save lives; armoured columns were advancing on Benghazi. We could not have taken that action with France had we had to wait however many hours to call the House together. It is not possible to give 100% guarantees, but on a question such as the supply of arms to someone else in world, it is possible to anticipate that and therefore to debate it in advance. Mr Peter Hain (Neath) (Lab): Has the Secretary of State consulted Lord Ashdown, whose commission included both a senior republican and a senior member of the Orange Order, and was able to come to a consensus? Will she also talk to Roger Poole, whose chairmanship of the Parades Commission was very successful? There might be lessons there. Mrs Villiers: I am happy to talk to both of those individuals. That would be very useful. Mr Peter Hain (Neath) (Lab): Why does the Secretary of State not consider the kind of business model used by Welsh Water, which the Library has advised me is perfectly compatible with the Act, which successfully combines social obligations and commercial imperatives and raises capital more cheaply without contributing to Government debt? A survey by the Tory Bow Group shows that 67% of the public oppose privatisation, as do 96% of the work force. Why does he not stop dogmatically pursuing a flotation and instead adopt that positive, popular and viable alternative? Vince Cable: There is a long and complex debate about how water companies are operated. Of course, they have extremely high gearing because of the nature of their business and do not require anything like the same level of equity. We have a model that combines the best use of equity markets and the level of debt that the company will need to finance its future investment. Mr Peter Hain (Neath) (Lab): But is not the truth that amid all the Minister’s spin and management-speak, she is strangling Remploy to death, and there is no prospect of the most vulnerable disabled workers in their 50s who work there all the time getting jobs in mainstream employment? By the way, her description of the 2008 programme is a total travesty. There was a £550 million subsidy for that, which she has cut savagely, and there was a programme for getting people into mainstream work, too. Also, she has given no guarantees, despite my asking the Secretary of State, and nor has the preferred bidder, who is based in Yorkshire, that the Neath Port Talbot site at Baglan will remain open. Can she give a guarantee on that now? Ms Esther McVey: I have a couple of points to make to the right hon. Gentleman. There was no spin in what I said; those were the numbers, and he is more than welcome to verify them. As for his comment about strangling, that is incorrect, too. I would say “liberating”. That is why some of the factories that closed have reopened and we are supporting them as best we can. If I were him, I would claim no credit for spending £555 million in 2008 on a modernisation process that went nowhere, or for estimates for contracts in the public sector that were grossly exaggerated—by 130%—and which never came to pass. Ours are real, they have been justified, they are monitored by an expert panel and KPMG is involved as well. Mrs May: I am absolutely clear that any junior officer asked to do something that they should not be being asked to do by a senior officer should be able to report that and ensure that appropriate action is taken. Any former officer in the special demonstration squad or anybody who has any information or allegations about the squad should come forward so that Operation Herne can have all the information available to it in the investigations that we all agree it must undertake. Mr Peter Hain(Neath) (Lab): Can the Home Secretary think of a more grotesquely perverted sense of police priorities than where, instead of hunting down and prosecuting those responsible for the vicious racist murder of a talented British youngster, they infiltrate an undercover agent into the campaign to secure justice? Will she assure the House that she will look personally at every undercover operation and check that nothing so dreadful is going on today? Mr Hain: I did not say that. The Prime Minister:We are insisting that a proper conference must include representatives of the regime and representatives of the opposition, and that it should lead to a transitional Government. The UK Government have a clear view that neither of those stages can involve President Assad, for the reasons we have given, but that should not stand in the way of the transition that is necessary, and the transition that everyone in the G8, Russians included, believes is right. Mr Peter Hain (Neath) (Lab): I hope Iran is included, because it is a key player, but whether or not it is included, can the Foreign Secretary say to the House in absolutely crystal clear terms that, if the Government decide to send arms to Syria, there will be a vote—I choose my words precisely—on a substantive motion before that decision is executed? Within that, I define as arms British planes policing a no-fly zone and possibly bombing anti-aircraft installations of the Syrian Government, and training, which could be training on the ground. Will he confirm a quote in The Sunday Times on Sunday: “One senior Tory source said…‘The bottom line is that we will avoid at all costs a vote as we don’t think we can win it”? This is a cross-party matter. Mr Hague: It is a cross-party matter. My right hon. Friend the Prime Minister and I have made the position clear, so I do not think that the right hon. Gentleman needs to look at “a senior Tory source”. There is no Tory more senior than the Prime Minister. [Interruption] Occasionally, one or two might think they are, but there are no Tories more senior than the Prime Minister and he has made it clear that the Government have a strong record of holding votes in the House of Commons on these issues when it is necessary to do so. We certainly would not want to pursue any aspect of our policy on this issue against the will of the House of Commons. That is neither feasible nor desirable, so of course we have made clear that there would be a vote. I have also made it clear that we would expect it to be before any such decision was put into action. Mr Peter Hain (Neath) (Lab): I welcome the general tone of the Foreign Secretary’s comments, but is it not time to stop treating Iran as a pariah state and to treat it instead as a proud nation which plays a key role, if a nefarious one, in so many middle east conflicts? Should he not press for direct engagement with Iran on Syria and on Israel-Palestine? Now that its people have voted directly to engage with the west on the basis of respect, even if their Government have policies with which we bitterly disagree, it is surely essential to press that engagement. Unless we do, I see no prospect of the middle east, which is in one of its most unstable and dangerous situations ever, stabilising. Iran holds the key to that. Mr Hague: It has to be recognised that Iran has brought its isolation and economic sanctions upon itself, through its own actions. However, the British people have no quarrel with the people of Iran. Our dispute is over Iran’s nuclear programme. It will be difficult to create the atmosphere to address constructively with Iran all the other issues in the middle east that the right hon. Gentleman has quite legitimately mentioned without settling the nuclear issue. That is the central point. That is not just the view of the UK; we must remember that the E3 plus 3 include China and Russia, and our negotiating position is agreed with them. We are all agreed that the Iranian response has not been adequate or realistic so far. A change in that situation would unlock the opportunity for us to work together on other issues, and for Iran to be treated with the respect that the world would owe it as a major nation in its region. That is all there for the taking if we can resolve the nuclear issue. Mr Peter Hain (Neath) (Lab): Surely the Prime Minister must accept that Britain’s insistence on Europe opening the door to more arms entering that ugly arena in Syria has led to two consequences. The first is the Russian escalation, with its introduction of S-300 missiles into the arena. The second is the near collapse, if not the actual collapse, of the vital international peace conference. The alternative is not inaction, as the Prime Minister has implied; it is serious negotiation to get the conference off the ground without preconditions, without assisting that Assad must go, which would stop the conference, and without insisting that Iran should stay out of the negotiations, which would also render the process stillborn. The Prime Minister: I have great respect for the right hon. Gentleman, but on this occasion I have to disagree with him on both counts. First, it is completely wrong to pretend that Russia has changed its view of Syria or its supply of arms to that country because of the European Union’s decision. Russia has been supplying the Syrian regime with arms for decades, and it has done so during this conflict. To suggest otherwise is really quite naive. I fully support the idea of the peace conference, which is why I flew to see President Putin on the Black sea and why I held discussions with Barack Obama. We should do everything we can to bring the parties together at this peace conference, but I would put the question again: are we more likely to get some sort of compliance from President Assad at a peace conference that would result in a transitional government if he believes that he cannot win militarily? That is the question that we have to put to ourselves. Mr Hoban: I remind the right hon. Gentleman that he was in the Government who introduced the work capability assessment and the employment and support allowance. I have set out the improvements that we have made to the system that we inherited from the previous Government, which was not working. We are continuing to make reforms, and that is demonstrated by fact that the proportion of people claiming employment and support allowance has tripled under this Government. Mr Peter Hain (Neath) (Lab): What sort of early intervention have the Government ordered to prevent a contagious spread of measles from the outbreak in the Neath and Swansea area of more than 700 serious cases? Thousands of parents across Britain will have been tormented by the choice of whether to vaccinate their children for measles, mumps and rubella because of the scare. Surely the Minister should take serious action to instruct public health officials to combat this issue. Dr Poulter: We are taking exactly that action to make sure that the vaccine is available and to promote the uptake of it. The right hon. Gentleman will of course be aware that the problems and concerns about the failure of some families to take up the vaccine resulted from some mis-used data in the past. That was a regrettable incident concerning the use of medical data, and is unfortunately causing great problems now. We are committed to making sure that those vaccines are available to the children who need it. Mr. Peter Hain (Neath) (Lab): Contrary to the Chancellors mantra, Britain’s return to recession was not made in Europe. It was made in Britain by the severe fiscal squeeze that the Chancellor launched nearly three years ago. Problems in the eurozone spell trouble for the UK economy—of course they do—but the Chancellor never mentions the fact that Britain has benefited from the recovery of the USA economy, which accounts for 20% of our trade, and is currently growing four times faster than the eurozone is slowing, because the USA took the route of economic stimulus and stuck to it. Britain set out on the same path under Labour after the banking crisis, and the economy began to pick up. However, the coalition veered off as soon as the Tories and Lib Dems took office, turning the road to recovery under Labour into the road to ruin. Cutting too far and too fast means that the Chancellor has missed all his key targets. In the year that is ending, his target deficit—the cyclically adjusted current deficit as a share of gross domestic product—is twice what he originally said it would be. Next year, the Office for Budget Responsibility expects it to be four times what he planned. He has also missed his public sector debt target: instead of falling to 67% of GDP in 2015-16, under the Budget it will fall to 85% two years later, in 2017-18. That is a surreal definition of success: debt falling upwards. Salvador Dali would be proud. “A few years of 3% growth—and given the amount of spare capacity in the UK economy, there is no reason that should be infeasible…—and much of the problem will simply vanish”. Growth is the magic bullet for overcoming our deficit and debt problems. Mr Leigh: If, as the right hon. Gentleman says, the cuts have not yet hit home, which is quite right, why does he think that they have fuelled the recession? Mr Hain: Cuts have fuelled the recession because they have driven demand out of the economy. Getting the economy growing again, as I said, is the key to cutting the deficit, then stabilising and bringing down the debt burden. Once the economy is growing again, it will be much easier to deliver any remaining tax rises or spending cuts that may still be necessary because, as Jonathan Portes says, jobs will be plentiful, real incomes will rise and companies will invest again. The Tory charge is that Labour would increase borrowing. The answer is, yes, in the short term, we would, but to reduce borrowing in the long term. Borrowing more today can mean borrowing less tomorrow by getting the economy growing again. President Obama’s 2009 stimulus package added to the US federal deficit in the short term, but as US interest rates fell, spending and output rose, and dole queues shortened. As a proportion of America’s expanding GDP, its overall deficit has shrunk every year since 2009, contrary to what has happened to our deficit. A budget boost that triggered real recovery in Britain could follow the same pattern, speeding up the growth of UK national income, cutting the deficit as a proportion of GDP and causing the debt burden to fall. That is what the Budget should have been about, but old habits die hard as the coalition partners continue to peddle their big deceit. First, they said that the entire global banking crisis was caused by Labour recruiting far too many nurses, doctors, teachers and police officers, and that the trigger for the world financial collapse—sub-prime mortgage defaults in the USA—was all Labour’s fault. The second big deceit is their claim that today’s public sector deficit was caused by excessive Labour spending. To quote utterances of almost every Conservative MP as if on a dreary looped tape, too much Labour borrowing led to too much national debt, so the cuts are all Labour’s fault. They never admit the truth. They never say why, if spending was “out of control” and wildly excessive, the Chancellor in September 2007 committed a Tory Government to matching Labour’s public spending plans for the next three years, up to 2010. The Chancellor knew only too well that Labour’s spending was affordable, otherwise he would not have signed up to that. The Tories never acknowledge that, until the global banking crisis, British Government debt was low, below that of France, Germany, the USA and Japan, and lower than when we took over from the Tories in 1997. Ten years of steady economic growth under Labour allowed us to pay down debt by the equivalent of £90 billion today, saving taxpayers some £3 billion a year in interest payments. We did fix the roof while the sun was shining. Between 1997 and 2007, annual Labour borrowing averaged only one third of annual borrowing by the Thatcher and John Major Governments. This is the fourth dreadful Budget by a dreadful Government. It is the same old story from the same old Tories: Budget day blues for Britain. The Chancellor is playing a peculiar game of leapfrog with himself. Every Budget brings worse news. Every autumn statement confirms that things are worse than expected. The Government are failing on growth, failing to improve living standards, and failing on their debt, borrowing and deficit targets. They have got to make way for Labour. Richard Graham (Gloucester) (Con): Brushing aside the unhappy attempt by the right hon. Member for Neath (Mr Hain) to rewrite recent history, I shall move on swiftly to discuss the Budget. Let us begin with the introduction of £10,000 tax-free income. Mr Hain: Will the hon. Gentleman give way? Richard Graham: The right hon. Gentleman has had his chance. Mr Peter Hain (Neath) (Lab): But will the Foreign Secretary accept that the logical next step in the strategy that he has been pursuing for six months, if not more, is to arm the opposition? That is the logical position that he is now in, but I think that it is profoundly mistaken. Every time he has made a statement on this matter in the past six months, he has carried the whole House with him in eloquently condemning the horror, the deterioration and the barbarity of the evil Assad regime, but his strategy is wrong. Just going for regime change in what is a civil war, with its Shi’a-Sunni conflict and its reincarnation of the cold war, is never going to achieve his objective. What he should be doing, instead of just promoting the opposition’s call for negotiations, is testing the willingness to negotiate that Assad expressed over the weekend. He should test it to destruction, but he is not doing that. He is pursuing a failed strategy involving a monumental failure of diplomacy, and it is making the situation worse. Mr Hain: It hasn’t been tried. Mr Hague: It has been tried countless times: Lakhdar Brahimi has been to Damascus countless times, and Kofi Annan before him went to Damascus countless times. Every possibility has been given to the regime to negotiate, but it has never entered into a sincere or meaningful negotiation. That being the case, it is not adequate to watch slaughter on this scale and say that we will stick our heads in the sand about it. It is important to have a foreign policy that relieves human suffering and upholds human rights. I would have thought that the right hon. Gentleman would always be in favour of that. Mr Peter Hain (Neath) (Lab): I urge the Foreign Secretary, in his forthcoming statement to the Commons, not to change Government policy. This is a military stalemate that cannot be won by the rebels or by the Government. Handing weapons to jihadists and Salafis who are leading attacks and planting bombs will make the killing worse, not better, and will hinder aid efforts with which the UK Government are helping. I urge him not to get dragged into the quagmire of a catastrophic civil war. President Assad, with all his flaws, announced at the weekend that we need to promote negotiations, and the opposition leader has said that he is ready to do so. Mr Swire: My right hon. Friend the Foreign Secretary will hear what the right hon. Gentleman says, and he makes a valid point. I stress again, however, that the change to EU sanctions legislation concerns the provision of non-lethal and technical assistance; it is not concerned with the provision of weapons or with arming either side. I repeat what I said earlier: the countries arming President Assad’s Government in particular should stop, because it is they who are directly contributing to the carnage unfolding in Syria. Mr Hain: Will the Secretary of State admit that his economic policies are failing Wales disastrously? His new jobs are a mirage. One new worker in 10 is underemployed. They are part-timers seeking full-time work or temporary workers who want a proper job. There are underemployed breadwinners who are struggling to put food on the table and heat their homes. That is contributing to the 200,000 children who are living in poverty in Wales. Why does he not apologise for that shameful record? Mr Jones: I will take no lessons from the right hon. Gentleman, whose party oversaw the trashing of the British economy and was responsible for the mess that we are having to clear up. The Government have created more than 1 million private sector jobs since we came to power, against the international trend, and we are proud of that. Mr Peter Hain (Neath) (Lab): Will my hon. Friend comment on a particular feature of the Neath food bank? Some 1,400 people in the Neath area are dependent on the food bank. Around half of those are in work. It is not solely people on benefits who are dependent on food banks; people in work are, too. The Wales Office website has still not taken down the Secretary of State’s commitment that people in work will always be better off than they would be on benefits. Those people are dependent on food banks in my constituency. Kevin Brennan: Indeed. In a recent debate led by my hon. Friend the Member for Liverpool, Wavertree (Luciana Berger), my hon. Friend the Member for Cardiff South and Penarth (Stephen Doughty) mentioned that he had collected food for FareShare in Penarth. Many of the people being helped by the food bank were not the people one might expect, but people in work who were struggling to get by. The hon. Member for Monmouth (David T. C. Davies) has been keen to intervene; I note that a new food bank has opened up in Chepstow. I am sure that he will pay it a visit shortly, if he has not already done so. In Wales, the rapid expansion of food banks is a subject that resonates and rankles. It is symptomatic of an approach by the Government that represents a shift away from the British belief in the importance of social security, founded by the three great Welsh pioneers and symbolised by the old-age pension, national insurance and the national health service, and its replacement with the alien American concept of welfare stigmatism—the demonisation of the poor and the replacement of the state’s responsibility with the vagaries of the charitable handout. The good society has been gazumped by the ill-named “big society”, in which well-meaning individuals try to patch the gaping holes created by austerity economics. Mr Hague: I will give way to the right hon. Member for Neath (Mr Hain) and then to one Government Member. Mr Peter Hain (Neath) (Lab): I am grateful to the Foreign Secretary; he is being very generous. Having represented the Government for two years in Europe, it is clear to me that we can best stand up for Britain’s interests, and sometimes achieve our objectives against all the odds, by building alliances and friendships and being right in there negotiating. How is he getting along with that enterprise? Mr Hague: I have just pointed out many of the things that we have achieved. The reason we have had such strong support from Germany, Finland, Sweden and the Netherlands on the EU budget is that we have built alliances. The reason that the EU patent regime has been brought in is that we have built alliances. I hope that that is well understood by Members from all parts of the House. Mr Peter Hain (Neath) (Lab): I welcome the priority the Prime Minister has given this matter and the tone of his statement, especially his focus on the political and not simply the security. To add to the question that has just been put to him, the truth is that our diplomatic capacity in that region has been cut, not simply under his Government but, sadly, under our Government too. Will he look at that capacity? It is not simply about our diplomatic capabilities, but about our related ones. Unless we focus resources on the areas where the threats are—and that means the Foreign Office’s budget not being continuously chopped, as it has been in recent years—we will not be able to deliver. The Prime Minister: I will look very closely—it is absolutely right to look closely—at what diplomatic resources we have in that part of the world. I would simply make two points. One is that the Foreign Office actually got a reasonably generous settlement in terms of public spending and has been opening embassies in parts of the world where there are really important economic priorities for Britain, particularly in south-east Asia. The second point is that when we look at west Africa, we should be very much thinking about how we will work with our partners—I have already had this conversation with President Hollande and President Obama. We have particularly strong ties with countries such as Nigeria; France has particularly strong ties with countries such as Mali. It does not make sense for us all to double up in the same places but, working together, we need to ensure that our coverage is very good. Mr Peter Hain (Neath) (Lab): What assessment he has made of the economic effect on people working in Wales of reductions in tax credits and other benefits for working people? The Secretary of State for Wales (Mr David Jones): The measures announced in the autumn statement will mean that working households are on average £125 per annum better off in 2013-14. Mr Hain: Is the Secretary of State aware that Neath food bank is now seeing more people in work—many part time and desperate—than out of work? One hundred thousand working people in Wales are now being hammered by his welfare cuts, some among the 230,000 households in Wales that will be forced by the Government to pay council tax for the first time in April. Will he now take down from the Wales Office website his promise that people will be better off under this Government in work and admit that some cannot even afford to eat? Mr Peter Hain (Neath) (Lab): Does the Minister share my scepticism at the French Foreign Minister’s prediction that French soldiers will be out of Mali in a matter of weeks? That seems pretty unlikely to me. On the comparisons with Sierra Leone, does the Minister agree that it would be wrong to make the wrong comparisons? ECOWAS was deployed in Sierra Leone, and I understand that it will quite rightly be deployed in Mali, but the situation in Sierra Leone required British troops to go in and defeat the terrorists there. The second point on Sierra Leone is that there were no jihadi extremists with an international dimension, including al-Qaeda. Sierra Leone was a specific situation, fuelled by blood diamonds. For all those reasons, I believe that the situation in Mali could become an incredibly long-drawn-out morass, and we must be careful to promote a political solution to it. Mark Simmonds: The right hon. Gentleman makes an interesting point. He is right to highlight the complexity of the situation, and the fact that it will take some considerable time to arrive at a complete solution—a political resolution to the problem and providing stability to enable the northern part of the country to be part of the territorial integrity of Mali. The United Nations resolutions are absolutely clear that the political process is a fundamental part of finding a stable, long-term solution to the problem. I very much hope that the French-led military operation, to which we are providing limited logistical support, will be a short time-frame deployment. However, the right hon. Gentleman is right to say that the diplomatic, political and economic processes will take some time. Mr Peter Hain (Neath) (Lab): I say to the Secretary of State that condemning the deplorable violence is the easy bit, and will she do two further things? First, given her national security responsibilities will she engage directly with the loyalist groups and be willing to talk even to those who may be on the fringes of the violence—as we did to positive effect in 2006-07—who feel excluded from the political process? Secondly, will she come up with a package of resources to tackle the deplorable level of youth unemployment? Some of the young republicans—and in recent times the young loyalists—involved in this violent activity have no stake in the society. That does not justify their violence but it does explain why it is happening. Mrs Villiers: I certainly think that part of the way forward is an inclusive dialogue that must be led by Northern Ireland’s political parties. Indeed, as part of our work I and the Minister of State engage in regular conversations and listen to the concerns of people across the community. Addressing youth unemployment is one of the UK Government’s highest priorities. Employment figures across the UK have been improving over recent weeks but there is still a very significant problem, particularly in Northern Ireland. The issue continues to be one of our highest priorities and we will continue to work with the Northern Ireland Executive on ways to grapple with it. One reason David Cameron chose to bring the G8 to Northern Ireland was to demonstrate his commitment and attract inward investment.